So I found this device on Amazon for $15 and I’m going to try it out to press tobacco! 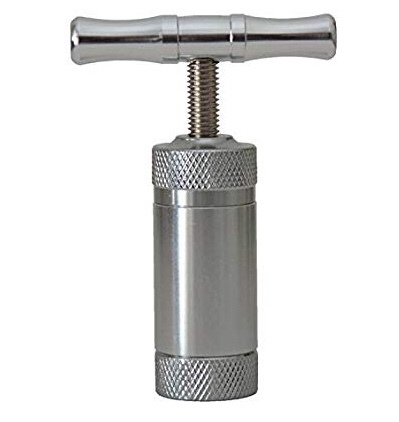 Anybody ever used one of these, it seems like it’s originally intended for some sort of use associated with pot or something, but it looks like it will work well and much more easily than some DIY contraption I might come up with. Anyway I want to try and make my own pressed and flavored plugs, I’m gonna try to make a cranberry or spice one leading up to thanksgiving. Will report my results. Looking forward to following your endeavors, I roll my own cigars and have been thinking about making my own pipe tobacco too. I've watched several videos on pressing tobaccos with homemade presses and I don't think I get the idea. Is the idea to take existing blends to put into a cake or is the idea to buy whole leaf and make your own blend into a cake? I have one of these inbound. Must be shipped from Neptune. I need to see where it's at. I already have plans for when it arrives. Doing some family visit travel so, I won't be able to play with it until I get home. I wanna make me a coin blend! Last edited by DepartedLight on Sat Nov 10, 2018 6:48 pm, edited 1 time in total. Dude. Get one. We'll trade samples. ryland wrote: I've watched several videos on pressing tobaccos with homemade presses and I don't think I get the idea. Is the idea to take existing blends to put into a cake or is the idea to buy whole leaf and make your own blend into a cake? Could be either, but the outcome is a greater level of combining ingredients, it’s like the difference between mashed potatoes and chopped up potatoes. Indeed, I created a blend recently actually, I need to find where I wrote down what’s in it, but anyway, I should send you some soon. Talk to me first. You like some bizzaro stuff. However, you are my first target demographic (of one) using the new Bakky Plugger 4000 when it gets here. Still in the works. I need to figure out how to layer the bakky to make cool coins. I almost have a VA Lat blend at the Really Yummy state. Just need to tweak it a touch. I want to see what happens if i sub in a Chocolate Cav rather than the unflavored black. Huh? After that it's add KY Fired and Vitamin P in a condemental 1:2. Squish for 4-6 weeks. See what we've got. Well, what you got cuz I aint smoking it. equal parts founding fathers, Red va, and 1 part half Perique half Latakia. It’s a nice mild English. See? This is exactly what I am talking about. Don't send this crap to me. I wanna make a blend where I capture the sweet esoteric complex effervesce of Unicorn Skittles farts. ...I wanna make a blend where I capture the sweet esoteric complex effervesce of Unicorn Skittles farts. I will make the tin art happen. I use a couple of 2x4s and some bar clamps.